Recrimination Is Not a Plan Islamic State has Washington paralyzed. Here’s a way forward. These are charges, not answers, and they are getting us nowhere. Bitterness and begging the question are keeping us from focusing on what is. We’re frozen in what was. 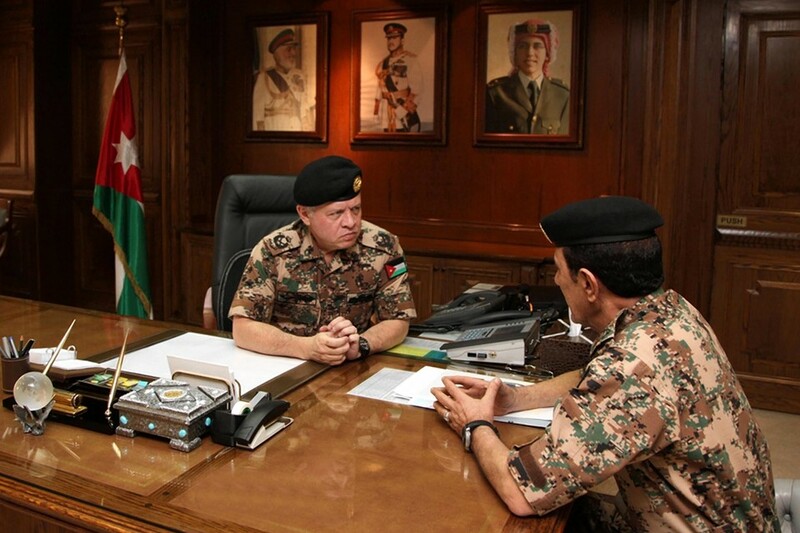 King Abdullah II, the Supreme Commander of Jordan Armed Forces (L), meeting with Chairman of the Joint Chiefs of Staff Gen. Mashal Mohammad Al Zabin (R) in Amman, Jordan, on February 5, 2015. There’s plenty to learn and conclude from the past. Great books have been and will be written about the mistakes, poor thinking and dishonesty that accompanied the 2003 invasion and the 2011 withdrawal. But at a certain point you have to unhitch yourself from your predispositions and resentments and face what is happening now. The White House is paralyzed, the president among the coldest of the frozen. He erects straw men, focuses on what he will not do, refuses to “play Whac A Mole,” waxes on about reading a book about the pains of the deployed. He’s showing how sensitive, layered and alive to moral complexity he is instead of, you know, leading. At the National Prayer Breakfast Thursday, he airily and from a great height explained to the audience that ISIS exists within a historical context that includes the Inquisition, slavery and Jim Crow. “People committed terrible deeds in the name of Christ.” Oh West, you big hypocrite. This is just the moment to dilate on Christendom’s sins, isn’t it? While Christians are being driven from the Mideast? He always says these things as if he’s the enlightened one facing the facts of the buried past instead of the cornered one defeated by complexity, hard calls and ambivalence. He is lost. His policy is listlessness punctuated by occasional booms. The public is agitated by the latest killing, of the Jordanian pilot burned alive. That murder may have changed some calculations. Jordan’s King Abdullah is said to have quoted Clint Eastwood during his recent Washington trip: “He mentioned ‘Unforgiven,’ ” a congressman said, without specifying which scene. Well, good. Which returns us to the question of a plan, a way forward. We know ISIS is increasingly hated by the civilized world, and by many nations in the Mideast. Each day that brings new word of their atrocities, not only to prisoners but to local, subjugated populations, adds to the anti-ISIS coalition. But we also know they will not be defeated or decisively set back from the air. They have to be removed from the areas they hold. They need to be fought with boots on the ground. Some wisdom on that from two veteran players in U.S. foreign policy, former Secretary of State James Baker and the president of the Council on Foreign Relations, Richard Haass. I spoke to Mr. Baker at CBS before his appearance. He said the world is “coalescing,” and this is the time to move, with diplomacy and leadership. So, a multinational Arab and Muslim military force to fight ISIS on the ground. Is this the right way to go? That partner should be “a multinational Arab-led expeditionary force—a force on the ground to take territory. It needs to be Arab and it needs to be Sunni, because you need to fight fire with fire.” It is crucial, he says, that Sunni Arab leaders demonstrate it is legitimate to stand up to ISIS. So—move to kill the Islamic State’s mystique. Give them a fight, make them the weak horse, and do everything to bring together the Sunni Arab world to do it. The U.S. would have to lead, push, press, promise and cajole. It would have to use diplomatic and financial muscle. But it would be doing so with allies increasingly alive to the threat ISIS constitutes not only to the world, but to them. And it is a plan. Who has a better one?